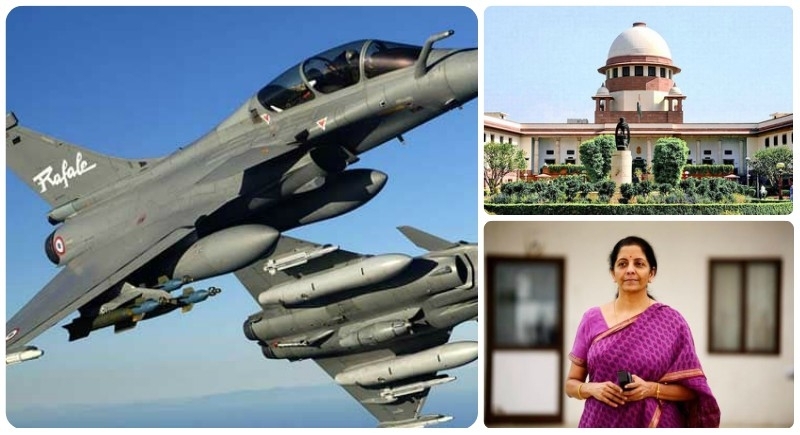 New Delhi, September 19: The Supreme Court on Tuesday adjourned the hearing on a PIL seeking a stay on the Rafale fighter jet deal between India and France. A bench of Justices Ranjan Gogoi, Navin Sinha and K M Joseph adjourned the matter till October 10th. Petitioner advocate M L Sharma told the bench that he wants to file some additional documents in the case and therefore the matter should be adjourned. On the other side, rebutting Congress' charges against the Narendra Modi government over the Rafale deal, Defence Minister Nirmala Sitharaman on Tuesday held the erstwhile UPA regime responsible for Hindustan Aeronautics Ltd (HAL) being overlooked for the jet deal. "The UPA government could have done anything to strengthen HAL's offer, to make sure its terms were appealing enough for Dassault, they could have done everything to ensure the terms were appealing enough for Dassault to conclude the agreement," Minister Sitharaman said. "This entire issue of HAL not being chosen happened during their (UPA) time, so all these questions that they are now directing at us should actually go to them. You have not taken care of HAL, you have not made the terms appealing enough for the HAL to successfully bid with Dassault," she said.